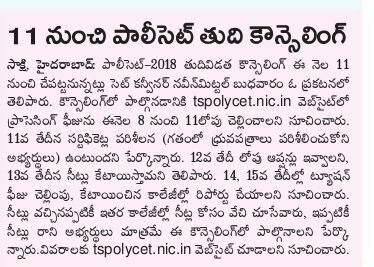 TS Polycet Final Phase Counselling Dates 2018 Rank Wise, Certificates Verification details are available at tspolycet.nic.in. The Qualified Candidates of TS POLYCET-2018 who have not attended for Certificate Verification earlier shall get their Certificates verified from designated Help Line Centres mentioned in the Annexure I. The candidates who have participated in Phase-I Counseling can also exercise options using their old password, Login ID, for the leftover seats now available and consequential vacancies that may arise in the process of allotment as per the schedule given below, and it is advised to exercise options for interested Polytechnics assuming that vacancies are available in the course of their choice. 3. IMPORTANT:-The candidates shall refer to https://tspolycet.nic.in for information regarding addition or deletion of any Polytechnic Colleges/Courses up to the day proposed for exercising options. Hall Ticket in respect of CBSE / ICSE/ NIOS/ TOSS/ APOSS candidates. IV to X Study Certificates. In respect of Non-Local candidates to consider them for allotment under unreserved seats the following certificates needs to be submitted. Residence Certificate : Candidates who has resided in the State for a total period of 10 years excluding periods of study outside the State ; or either of whose parents have resided in the State for a total period of 10 years excluding periods of employment outside the State. Employer Certificate : Candidates who are children of parents who are in the employment of this State or Central Government, Public Sector Corporations, local bodies , Universities and other similar Quasi Public Institutions within the State at the time of applying for TSPOLYCET-2018 Examination. The Tuition Fee for Government/ Aided Polytechnics is Rs. 3800/- per annum. The Tuition Fee for Private Un-Aided / Self Finance Branch offered in Aided Polytechnics is Rs. 15500/- per annum. The provisional allotment of seats will be made on 13-06-2018 and will be placed in the website https://tspolycet.nic.in. Pay the Tuition Fee mentioned in the Provisional allotment order through online (Net Banking / Credit Card / Debit Card) within the prescribed time to confirm the provisionally allotted seat. If the candidate does not pay the prescribed Tuition Fee within the schedule mentioned, the provisional allotted seat automatically stands cancelled and he / she shall not have any claim on the provisionally allotted seat. In candidate’s login, for all candidates after Self Report through online system, the admission number will be generated. Take the printout and report at the allotted college from 14-06-2018 to 15-06-2018 and handover the original certificates. The candidate will forfeit 100% of Tuition Fee paid if he / she fails to report at the college by 15-06-2018.